The spring of 2017 marked the greatest spring bloom California has seen in over 15 years, a phenomena even visible from space. Not one to shy away from an excursion, contemporary impressionist Erin Hanson raced to experience this incredible and rare occurence in Southern California's iconic Borrego Springs to photograph the lush blooms before they crisped in the brutal California sun. Hanson then went further in her travels and explored the super bloom in other parts of California, next traveling to Arizona and Texas hill country (which is famous for its wildflowers) to photograph the colorful flowers blooming after this year's heavy rains. 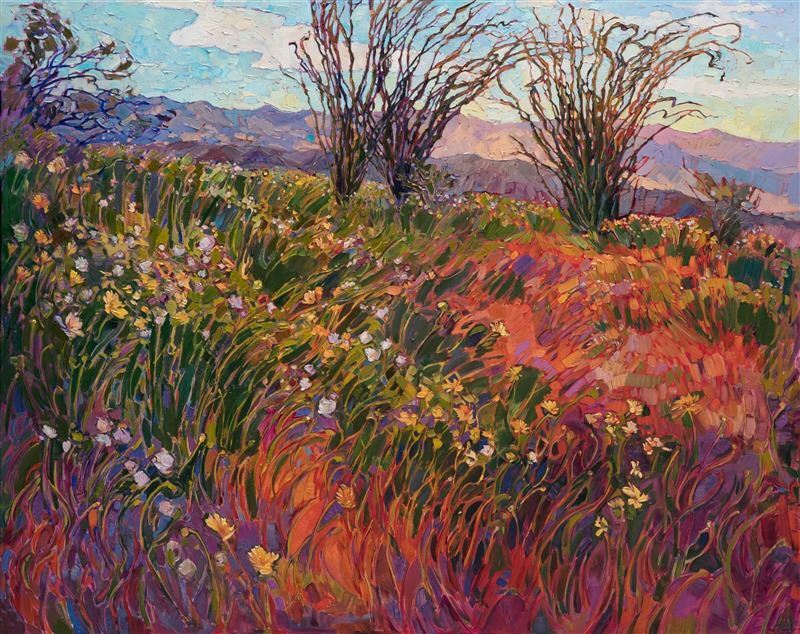 The Super Bloom Show features iconic blooming ocotillos and fields of lush wildflowers in Erin Hanson's signature open impressionistic style. This collection will be available for limited viewing at The Erin Hanson Gallery on Saturday, September 9th. Join us for live music, wine and refreshments. All are welcome to attend.